Halloween is the time of year where we embrace our fears and mock the things that would normally send us screaming from the darkness. Common villains such as witches, vampires, werewolves, and zombies that once drove our ancestors into hiding as the nights grew longer, are now common themes with their own fan bases in modern books, movies, and television. Times have changed since our superstitious ancestors hung bells on graves in case the dead would rise. Witches no longer hold the contempt that they once did when we believed they all wore pointy hats, were covered in warts, and their voices echoed with cackling laughter. The television show Charmed introduced audiences to the concept that witches could not only be good heroines but smoking hot, and not because they were burning at the stake. Thanks to Joss Wedon’s Buffy the Vampire Slayer and Angel series, vampires can be heroes and funny while witches are bubbly red headed sidekicks. Vampires have been reduced to characters in twisted love triangles with werewolves and some even sparkle in the sunlight. Book series like Laurell Hamilton’s “Anita Blake” read like a play by play of pornographic orgies between the heroine, vampires, and werewolves. The werewolves have become less of a nightmare and more of panting pups in modern literature and media as witnessed in the Twilight Saga. All of these characters, historically so beloved for their malice and evil are now merely brooding, misunderstood, love struck wimps. Who fears a sparkling vampire or a werewolf that is trying to save the world? My childhood nemeses are modern anti-heroes. Then I remembered the last holdout in the romanticism of evil…zombies. Zombies are unadulterated evil. Nobody wants to be romantically interested in a creature whose only desire is to eat your flesh. George A. Romero brought them to the screen in his classic “Night of the Living Dead” in 1968 and started the zombie sub-culture that we know today. With the exception of titles like “World War Z” by Max Brooks, large publishing companies were slow to recognize the public’s hunger for zombie fiction. It wasn’t until indie authors were able to give voice to zombie stories with the invention of e-publishing, that the book industry was finally able to provide many different takes on zombie lore. The popularity of the horror sub-genre of zombies and the indie author’s ability to publish new fiction prompted ground-breaking changings in other mediums as well. In 2010, AMC took a chance on a television series, based on Robert Kirkman and Tony Moore graphic novel “The Walking Dead”, to broadcast the first television series set around zombies. This month, “The Walking Dead” will begin its fourth season and rumor has it that there might be a spin-off related to Kirkman and Moore’s zombie world. Zombies have firmly rooted themselves into modern pop-culture. I, personally, was one of the late-comers to the genre. Years after it was published, I picked up my copy of “World War Z”. I quickly followed with Bourne’s “Day by Day: Armageddon”. I couldn’t get enough of the genre and sought out more. This fascination with all things zombie, took place around the time I received my first e-Reader. As I was looking for more titles, I came across the listing for an indie author named Mark Tufo and his “Zombie Fallout” series. Mark led me to another indie author, James Cook, and the “Surviving the Dead” series. Book after book, I have been reading all that I could get my hands on for well over two years and eagerly awaiting the next installment of each in the series I am reading. What is it that I like so much about stories of the smelly, slow moving, undead? Zombies fiction represents more than what is seen on the surface. While the zombie genre features the mindless, creatures that once were human; the stories are also about the fight to survive for those that are not infected. The survivors represent our fears of being alone, of battling something we cannot control, the will to hold on to our own humanity, and the importance of community. Zombie stories are stories of the choices we make in order to live another day. The stories are about the battle to continue on when everything around us has been lost. The stories of the zombie apocalypse are stories of hope. The month of October will highlight one of my favorite horror genres, zombie apocalypse. Each Tuesday, a new piece will be published leading up to Halloween. I hope to introduce you to some of the authors and series that I have been enjoying over the years. With Halloween drawing nearer it is time to celebrate, with a month long dedication to the last holdout of evil creatures. 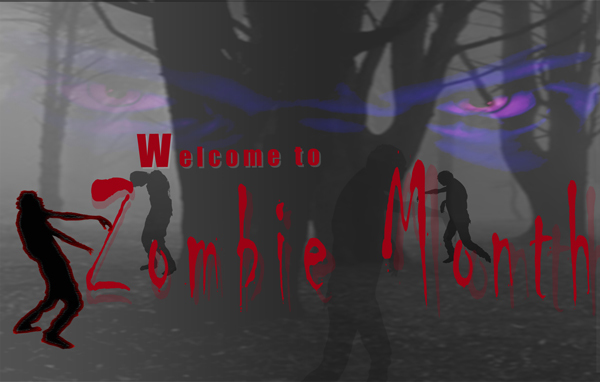 Welcome to Zombie Month at TTMM. Very nicely written piece. I absolutely agree with your interpretation of why zombie stories are so interesting and looked for. October is by far my favorite month. Autumn is in full swing, the leaves are falling, it begins to get cooler and the days run shorter. What more can a lover of the zombie genre love more? BTW, great post as well! Thank you. It is my favorite time of year. The thing that is going to make this October even better is Ranger Martin and The Zombie Apocalypse is coming out on October 22nd. I am looking forward to this part of October as well. Thank you for visiting. For those that get a chance. Check out Jack Flacco’s site at jackflacco.com and check out the new Ranger Martin and the Zombie Apocalypse.